With the TEX P90 we concentrated on two key factors for demanding customers: Prformance and Reliability. The TEX P0 is designed from a one-piece, solid-cast housing, which eliminates the need for separate front heads, back heads, and side bolts. This design means 30% fewer parts than in traditional breakers. And fewer parts mean fewer breakdowns. 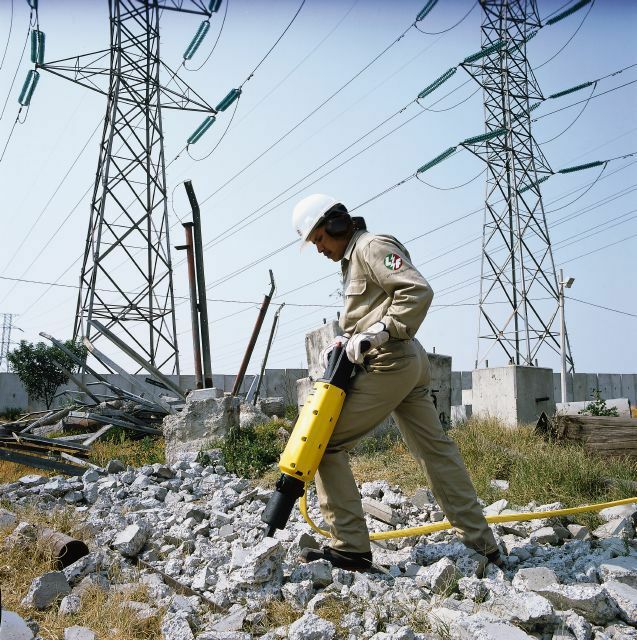 The TEXP90 is the most hard-hitting breaker in the TEX range and ideal for demanding demolition jibs in hard materials. Easy to maneuvre With a low center of gravity, these breakers are well-balnaced and easy to handle. 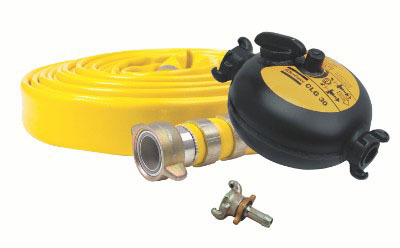 The unique air inlet swivel, which can be rotated even when pressurized, ake the TEX breakers still eaiser to maneuvre. Reduced Wear - The anvil bock, a tried and tested design from earlier heavy models, not only helps handle the great impact energy, but also helps avoid damage to the hammer mechanism from worn out chisel shanks. Full-Shift Lubricator The built-in lubricator ensures sufficient lubrication to minimize tool wear. It is easily accessible, accepts both mineral and synthetic oils and holds enough oil for an entire shift. Air-Cushioned Action The TEX P90 features air-cushioned piston return. This means less vibration during back hammering and blank hammering, which reduces stress on man and machine. Silencer The silencer significantly redices the noise level. Thanks to its slim design, it provides a full view of the chisel and work piece for maximum control. 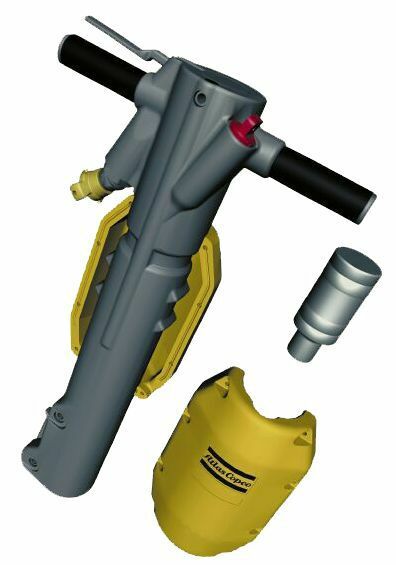 What more could you want from a class of heavy pneumatic breakers: good power-to-weight ratio, reduced noise and vibration, and extremely durable and productive. For years, these heavy TEX breakers have been proving their value to customers worldwide, under the most demanding of conditions. This series incorporates the TEX 40PE with spring dampened handles allowing up to 7 times the trigger time of conventional fixed-handled machines at a given level of vibration-exposure for the operator. By reducing the in-use vibration value of the machine, Atlas Copco's HAPS system decreases the negative effects of harmful vibration at a given trigger time. 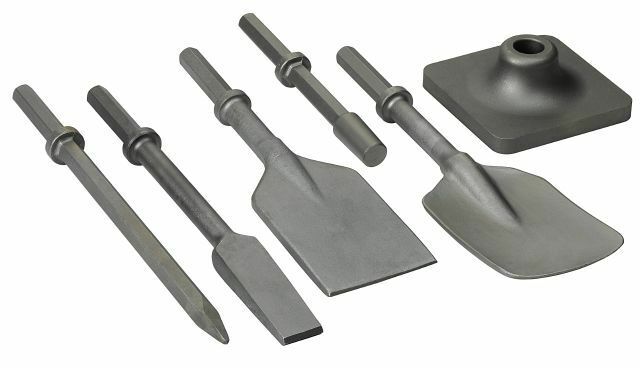 Coupled with the slim silencers, which reduces the noise level by up to 75%, while still providing full view of the chisel, you have machines that can be used for prolonged periods and are extremely productive. The Slim Silencer cuts noise levels by up to 75%, as compared to the same machine without noise reduction, and provides the operator with a full view of the chisel. Reduced Wear - The anvil block, a tried and tested design from earlier heavy models, not only helps handle the great impact energy, but also helps avoid damage to the hammer mechanism from worn out chisel shanks. The air inlet swivel can be rotated when needed - even when pressurized. This makes the TEX breaker one very maneuverable machine and together with its excellent balance, gives the operator an easy machine to work with, even under difficult worksite conditions. An integrated lubricator helps minimize tool wear. It holds enough lubricant to last an entire shift. In freezing conditions, it can also be used for anti-freeze. Air cushioned action - when the machines are working off-load, the piston turns on air cushions at either end of the cylinder, virtually eliminating metal-to-metal contact and reducing vibration and wear.